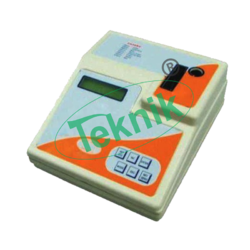 Microteknik provides you with the best range of Analytical Instruments such as Digital PH Meters, Microprocessor PH Meter, Field Digital PH Meter, Micro Controller pH Meter, Digital Auto Calorimeter, Digital Auto Colorimeter Analyzer, Digital Turbidity Meters, Field Turbidity Meter, Digital Nephelometer, Digital Conductivity Meter, Microprocessor Conductivity Meter, Field Conductivity Meter and many more items with effective & timely delivery. Range 0 to 1000 Mhos/cm 5 Range. Accuracy ±1% FS ±1 Digit. Complete with Operation Manual & Dust Cover. Resolution 0.1 %T, 0.001 Abs. Range D. O. 0 to 20.0 ppm. Range Temp. 0 to 50°C. Resolution D. O. 0.1 ppm. Accuracy D. O. 0.1 ppm ± 1count. Tamp. Compensation 0° C to 50°C manual. Accuracy of compensation D.O. ±3%. 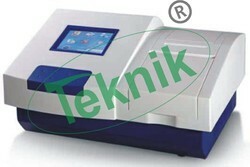 D. O. Sensor Amperometric gold/Silver Membrane type. Display 3½ digit seven segment LCD. Display 16 x 2 Alphamumeric display. 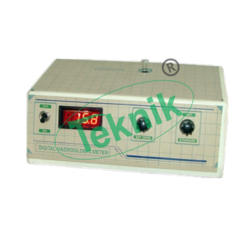 Range 0 to 20 ppm. 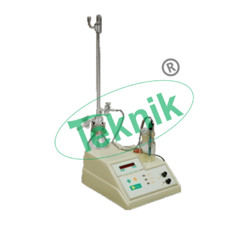 Sensor Amperometric DO Probe (Gold, Silver membrane Type). Display 16X2 Lines LED Display. Measuring Rang 0-40 gm/di of HB. Key Board Soft touch 4 days. Detector High sensitive silicon photodiode. 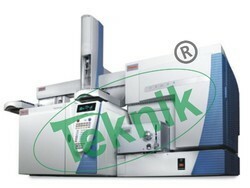 Optical System Single Beam, Grating 1200 lines/mm. 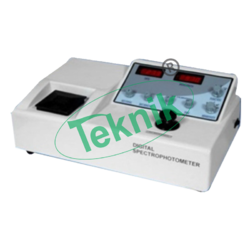 Photometric Display Range -0.3-3.0A,0-200%T, 0-9999C. Stray Light ≤0.3%T @220nm, 360nm. Lamp Deuterium Lamp & Tungsten Halogen Lamp. K.F. 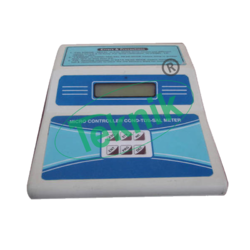 Flow Highly sensitive solenoid control volve for automatic control of K.F. Reagent. 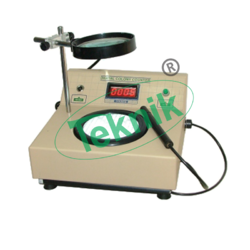 Measuring Electrode Dual Platinum Electrode. 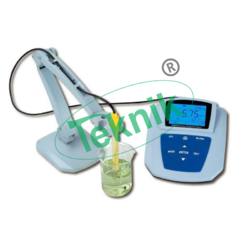 Titration Cell Air tight 200 ml glass vessel. 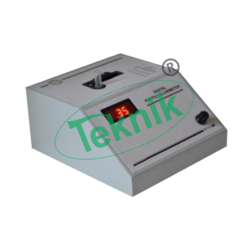 Stirrer Variable speed magnetic stirrer with On/Off control. 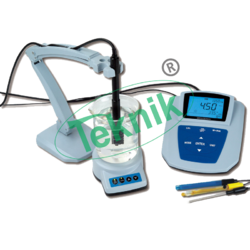 ACCESSORIES * Burette (Clear Glass) 10ml, * Reservoir Bottle 500ml, * Rubber Bellow for Pumping Air * Titration Cell 200 ml * Dual Platinum Electrode, * Teflon Coated Magnetic Stirring Capsule, * Nozzle, * Moisture Trap with Rubber Tubing, * Instruction Manual. Display 3 digit, Red 7 Segment LED. Key Board 2 Key Soft Touch membrane Type. Output OD : 0 to 1.99, %T : 0 to199. Resolution OD : 0.01, %T : 1 %. Main Feature Automatic zero calibration. 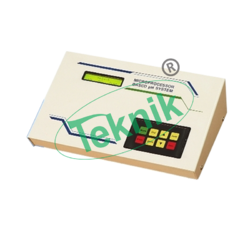 Display 16X2 line alphanumeric LCD. 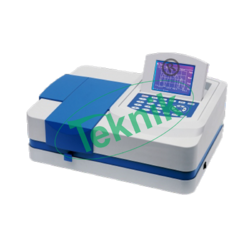 Display Modes %T, AB& # Concentration modes C1,C2,C3. Zero Adjustment Automatic (without knob rotation). Stability ±0.02 O.D Per Hour. Light Source 6.8Volt,3 Amps Tungsten Lamp. 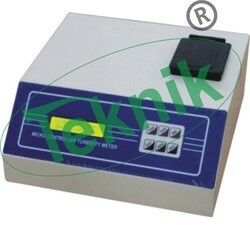 In Built Memory to retain three Concentration and last “K” factor for Concentration even after power loss. Fitted with automatic 3 Digits LED Digital Display. Counting plate with illuminated standard wolfhugel ruling ensures clearly differentiated and sharply defined colonies. Each touch of making pencil in the pertridish increment the colony count by '1' and the glowing LED Display depicts the total colony count. Maximum colony Count possible upto 999. 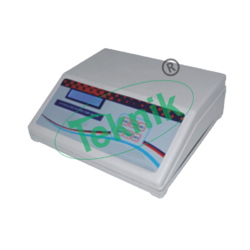 Provided with a manual reset of digital display, ON/OFF Switch, counting plate, 100 mm. dia lens, cord and plug. To work on 220V A.C. Same as above but 4 Digits EM-92 : Display with count possible upto 9999. No. of Filter Na & K (Ca & Li optional). 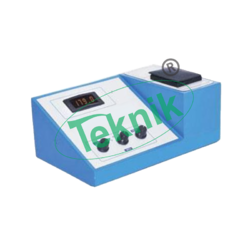 Range Na : 0-200 meq/l Ca:0-2 meq/l, K : 0-100 meq/l Li: 0-10 meq/l. Sensitivity Na : 5 ppm Ca : 10 ppm, K : 5 ppm, Li : 10 ppm. Read out Dual 2½ digit bright LED Display. 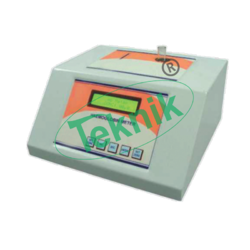 Accuracy ± 2% upto 100 meq/l, ± 5% above 100 meq/l. Filters Narrow band interference glass filters. 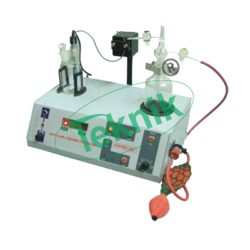 Nebulizer Black bakelite, axial flow type. Flame System LPG and dry oil free air. 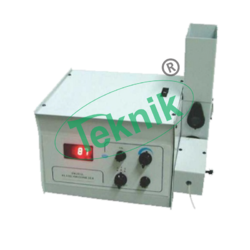 Power 230V ± 10% AC 50 Hz. 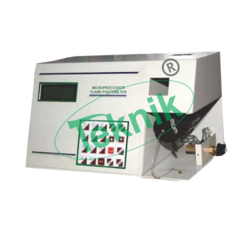 Air Supply By oil free mini compressor unit with pressure regular. Combustion LPG controlled by precision regulator. Instrument with Na & K Filters instruction Manual. Air and Gas Tubing Along with Clamp. 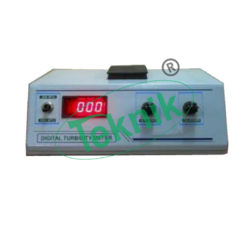 Display 3½ Digit, Bright LED. Display Mode O.D. And 3 Concentration Modes Ci, C2, C3. In built memory to retain last K factor for concentration even after power loss. Fluoro Sensitivity Full scale deflection obtained with 1 ppm quinine sulphate in 0.1 N sulphuric acid (primary Wavelength 360 nm). Display 3 digit bright red seven segment LED display. 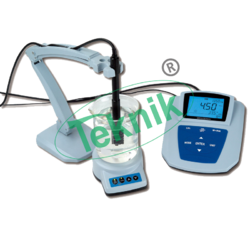 Excitation Source 12V, 50W Tungsten Halogen Lamp. Sensitivity Range Adjustable in 4 ranges. Slope Correction 80% to 120%. Accuracy ± 1 mV ± digit. 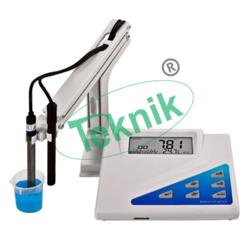 Operating Temperature 0° to 50°C. Display 3½ Digit LED display. Range 3 ranges 0 to 2, 20 & 50 ppt. Accuracy ±2 FS ± 1 digit. Cell Constant Adjustable on display. IR Library 11 IR libraries include. 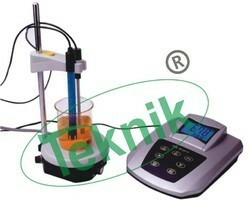 Function pH/mV & temperature Simultaneous. Display 16 ch. X 2 lines Alphanumeric BL LCD. 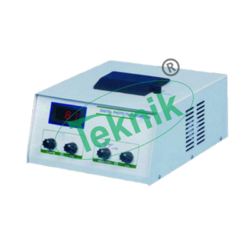 Power supply 230 V + 10 % 50Hz. Slope Adjust. 80% to 120% by default 100%. 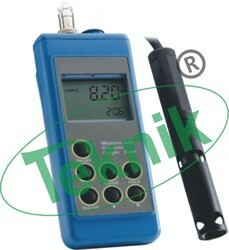 Auto buffer recognition 4.00 pH, 7.00 pH, 9.20 pH..
Calibration Auto & Manual, 3 point / 2 point Programmable. Time Display Real time 24 hours mode with date. Display 16 x 2 Alphanumeric LCD Display. Measuring range 10 ppm to 100% of moisture. K. F. Dispensing Highly sensitive motorized depensing system. 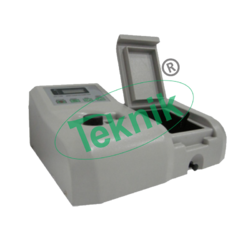 Dispensing pump Through keyboard 24 keys soft touch, membrane type. 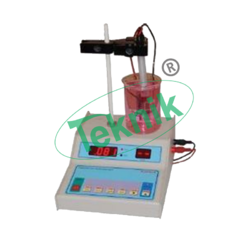 Stirrer in buit magnetic stirrer with control. Display 16X2 Lines Alfa Numeric. Rang 2 ranges 0 to 200 & 200 to 1000 Jtu/ntu. Accuracy ±3% of Full Scale Deflection in 0-1000 Jtu/ntu. Sample System 30 mm Clear Glass Cuvettes. Light Source 6.8 Volt, 0.3 Amps Tungsten Lamp. 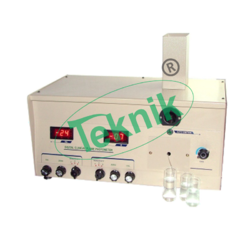 In built memory to retain both range standard solution and last set value even after power loss. With Dust Cover & Instruction Manual. • GC with split/splitless injector. 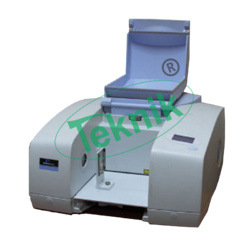 • MS features a mass range of 10-700 amu. • Heated Hyperbolic Quadrupole Mass Filter. • High-Energy Dynode (HED) Electron Multiplier Detector. • Data System complete including Pentium Computer with Windows Operating System and GC/MSChemstation software. • The system to include cables, manuals. Measurement Modes: Single wavelength, doublewavelength, electrometries, kinetics, multi-wavelength,external computer control modes. Measurement System: 8-Channel optical system. 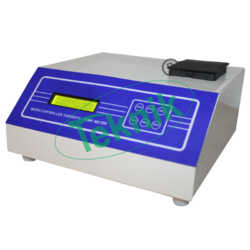 Calculate Mode: Absorbance, coefficient concentration,standard concentration, standard curve, single limitdetection, double limit detection, level detection columnsubtraction. Storage: 50 test item and 50 96-well results.